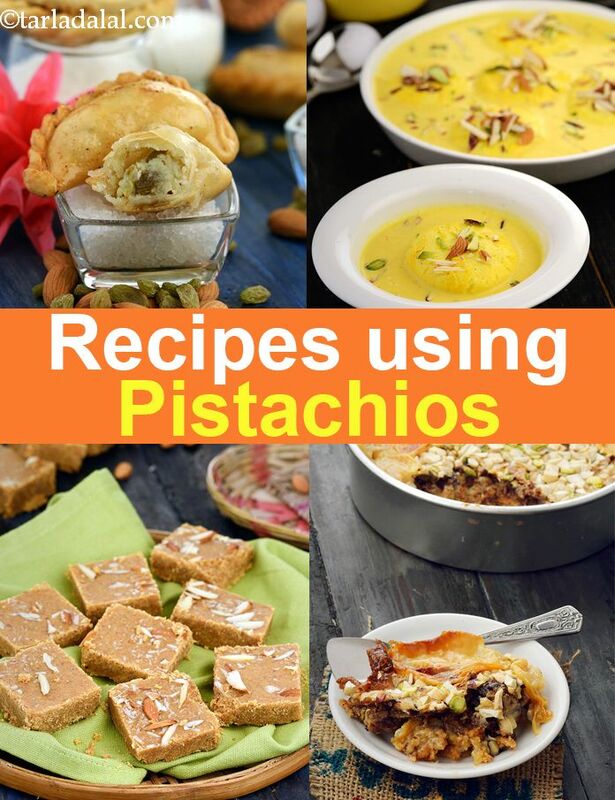 pistachios recipes | Indian pistachio recipes. Pistachios (or Pista) are a very popular nut for all age groups. They grow on trees and come in a tan shell. Once you open these shells, you get the nuts which have a green in color which comes from the presence of chlorophyll. These kernels are eaten either raw, roasted or salted and have a mild sweet, rich taste that goes well with Indian Sweets. They are also used to make ice creams, pastes and puddings. Almost all sweets in India use pistachios in them in one form or the other. They add a crunch and slight sweetness to the desserts. Sometimes we use also use pistachio powder to make the whole sweet or tiny bits just for garnish. Rice Kheer - It requires very few ingredients, and the procedure is simple as well. Here, the rice is cooked slowly in the milk. Once the rice is cooked, the kheer is sweetened with sugar, flavoured with cardamom and kesar and garnished with some chopped dried nuts, like pistachios. Shrikhand – Simple and humble dahi, when removed of its excess whey, gives a beautiful creamy thick yogurt which is then sweetened with powdered sugar, kesar and elaichi. Mix a few pistachios in the end for some crunch and serve your shrikhand cold! Pista Barfi – This barfi is mildly nutty in flavour and has an attractive colour, both of which make it very tempting. For this, the pistachios are first soaked and then blended into a fine paste and then cooked along with sugar and spices. Thandai Mousse – This is a mousse with a desi twist to it! The rich and creamy thandai is set into a mousse that can be served at holi or any other festival too! The ingredients like almonds, khus-khus and cardamom that are present in the thandai syrup give a slightly spicy touch to this mousse. Pistachio Soup – When we think of green soups, it doesn’t necessarily have to be a green vegetable. The creamy pistachio soup gives a different, yet pleasant mouth feel which is very rustic. Hope you liked some of the recipes we have given. Scroll down below for the whole collection of Pistachio recipes.